Love love love their katsu chicken with bbq sauce! Excellent Kim chi and seaweed! Very good service. Order by phone, always on time! This is a late review but better late then never lol. Pearl's is awesome. The end. Just kidding. I've eaten at Pearls many times on Oahu. Thank goodness there are two here on Maui here at Queen Kaahumanu Shopping Center and also at Maui Marketplace. Their food is consistently great and yes they are pricey but their portions are generous and we love their delicious ban chan (side). My sweety and I always order a regular size plate (usually a combo plate) and share it. The regular plates comes with 4 sides and generous scoops of rice. Their mini plates comes with 2 sides and less rice but their mini is perfect for one person in my opinion but I guess it depends on the person and how hungry you are lol. Check them out if you haven't done so already. It is located in the food court of the mall. There are plenty of tables and the dining area is well taken care off. The meat jun (Hawaiian breaded skirt steak) and chicken combo were absolutely delicious! Pearls is like one of the iconic Korean foods that I ever had they have the best food ever and customer service is friendly also. 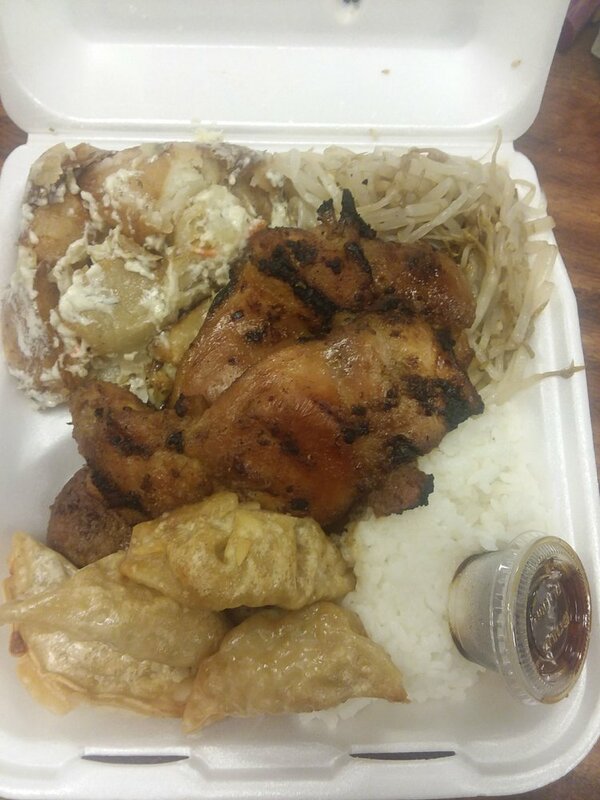 And they also have another pearls Korean food in Maui marketplace also. 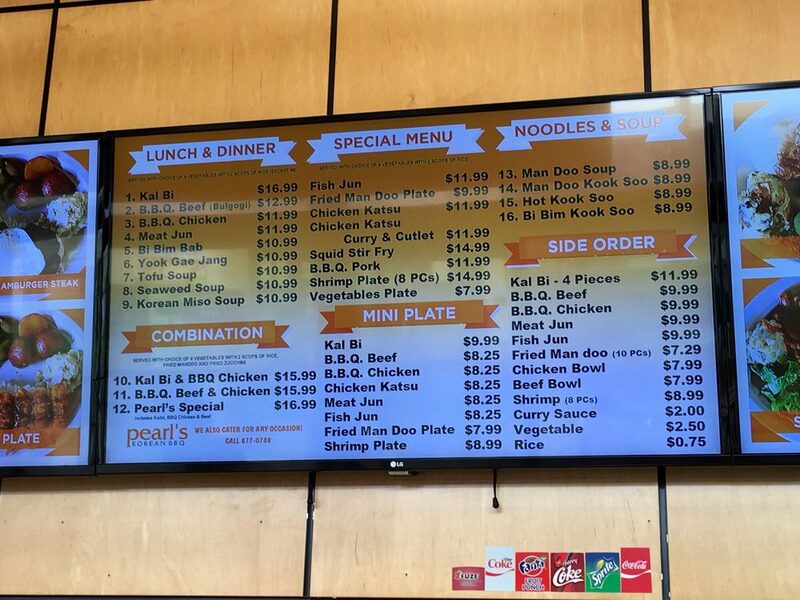 Come to find out, Pearl's is owned by Peter Kim, who also owns the Yummy Korean BBQ chain. Not sure why the name changed years ago at this location as the Yummy name still exists on Oahu. Oh well, as long as the food is still the same! He also owns Liliha Bakery and Lahaina Chicken Company. While Pearl's serves some everyday local dishes that are widely available elsewhere such as hamburger steak and chicken katsu, I choose to come here due to their delicious banchan (side dishes) selections. Why settle for just a scoop mac salad at L&L when you can get 3 more choices here? And the portions are almost twice as big. Hell yeah! The QKC food court location underwent a total makeover last year, sporting new TV menu screen, and a fresh, updated look. Great job! BBQ Pork - The insanely tender, marinated and lightly barbecued slices of boneless pork just melts in your mouth. The takeout tray is lined with steamed rice, then the grill-hot pork is laid out on top with all of its drippings soaking into the rice. Ahhhh! Then there's the 4 banchans you add to the dish. My favorites are the macaroni salad, bean sprouts, and potato mayonnaise. Huge portion! Chicken Katsu - Geezuz, this is probably the biggest plate lunch in the state! 2 to 3 huge pieces of breaded chicken were perfectly deep-fried and sat on a bed of rice with my usual 4 banchans surrounding it. I have a good appetite, but this turned out into 2 separate meals for me. That's how I like it as I hate small portions! As for the katsu sauce, I always use the Kagome brand bottled sauce as NO ONE does katsu sauce like them. Pearl's version is too tangy for me. Hamburger Steak - This one sorta doesn't belong under "my favorites" as my biggest complaint is that the onions that top the dish are raw. Yuck. I'm sure if I ask they can at least grill them a little. The rubbery patties I can deal with especially since I can get 4 choices of banchan, lol! Fried Chicken - Compared to their other dishes, this one was pretty small in portion size with just 8 pieces of chicken wings (4 wingettes and 4 drummettes.) They're not battered or floured yet were fried perfect and had a nice subtle & savory flavor. The staff are always friendly and welcoming. The food is fresh, so there will be a wait. I always call in my order and it's ready in 10 minutes. Half portion sizes are available if you're not a pig like me. But then you'll only get 2 choices of banchan, lol. 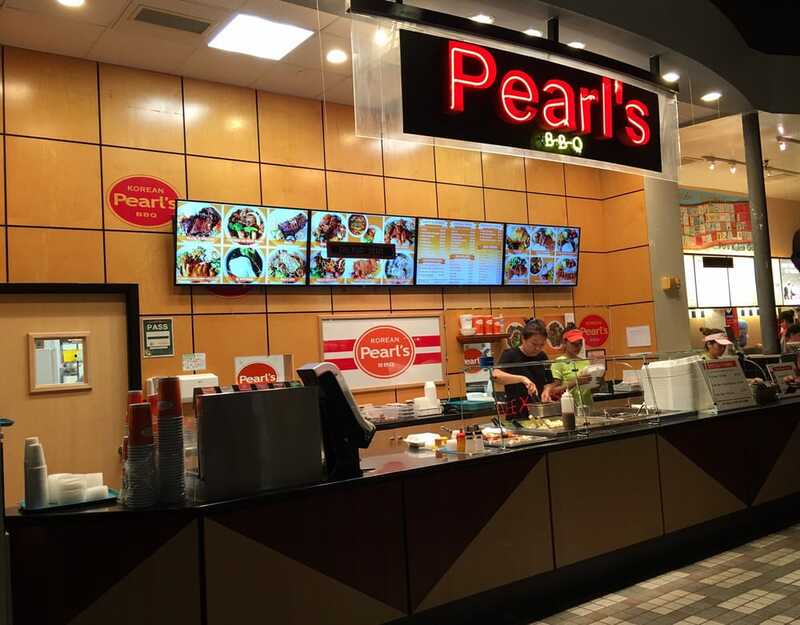 A second Pearl's location will be opening up in the Maui Marketplace food court sometime in 2016! Yes! A little pricey, big portions, delicious food, and that damn banchan bar is the best! This site is in no way affiliated with or endorsed by Pearl's Korean BBQ. It exists as a compendium of supporting information intended for informational purposes only.